Conceived with a rare depth of vision, this beautifully presented volume will add prestige to any library, being the final publication of the late Caroline Simpson, this book is a splendid example of her contribution to archival and historical publishing. Simpson's avid interest in colonial architecture, furniture and art was driven by an intense desire to understand Australian colonial society. Caroline began working with Sue Rosen in 1991 and in a return to the original documents, over five years were spent in archives in the UK and Australia. Illustrative material was sources anywhere between Parramatta and London including watercolours, oil paintings, maps and plans and photographs from newspapers to produce this extraordinary publication. A magnificent volume of 272 pages and 207 illustrations, quarterbound with gold foiling printed on acid-free art paper exceeding inter nation archival standards. 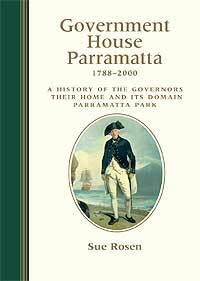 Government House Parramatta, 1788-2000 presents a fascinating and enjoyable read.